The best evidence for the happiest of marriages between local residents and long term visitors and supporters from elsewhere was - resoundingly - Islay. 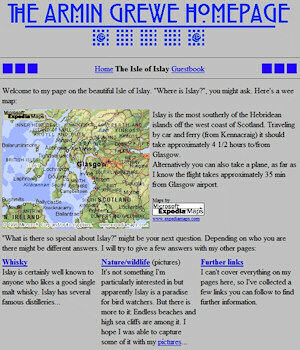 Islay is astonishingly well served by its key websites: Islay Info, Islay Weblog and Islay Blog. These are provided selflessly and imaginatively for the island by non-residents - yet. And in the voting, all three sites were supported with marked vigour and commitment by both islanders and by visitors. More than 10 years ago now I made my first visit to Islay. I had a great time and decided to come back, what I didn't know back then was what would develop out of it. Back then the internet and the ‘dot.com boom’ was just lifting off. Islay already had a presence on the web, the islay.com domain was first registered in July 1997, even earlier the islay.co.uk domain in March 1997. I still have the printout of Joanne Mackenzie-Winters' Internet guide to Scotland Isle of Islay accommodation, transport and sightseeing page from 1998 (the paper is yellowing a bit now, but I'm keeping it for nostalgia). Working for Intel back then I was quite familiar with the internet and what was happening with it. At some point in 1998 I first had an internet connection at home (back in the days when a 56k modem was considered quite fast...). 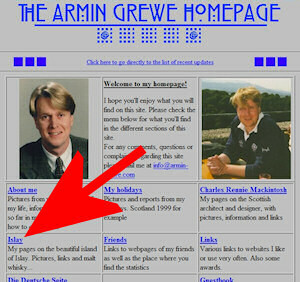 Partly out of genuine curiosity, partly because I thought it might be helpful in my job I started to dabble with my own website in early 1999. A website needs content. Having just fallen in love with Islay one of the topics I started to cover was obviously Islay. The seeds were sown. After quite enjoying my first experiments on the ISP webspace I took the next step in late 1999, registering my first domains and renting space on a shared server. With my second visit to Islay behind me (and the third being planned already) I started to put some pictures of Islay online, as well as my travelogues. From those small seedlings my current Isle of Islay pages and holiday & travelogue pages including many Islay Travelogues developed over the next 10 years. Having started to blog some time in 2001 in various places and also mentioned Islay a number of times on my Ministry of Propaganda the next step was almost logical: In early April 2006 I registered the IslayBlog.com domain and went live with this blog in May 2006. From the ‘normal’ blogging I've recently branched into photoblogging with the Islay Pictures photoblog. Most recently I've even started to try out microblogging. But it's not only about the pages I've written, the hobby that developed out of a holiday and some experiments with an editor and an internet connection: I've been able to communicate with people from all over the world about a common interest, Islay. They have shared their knowledge and information with me and I have shared what I had with them. I've made friends over the internet, some of which so far are only ‘virtual’, others I have since met in person, on Islay and elsewhere. Now I can't speak for Ron, but it looks to me his story will be similar: During his first visit in 2004 he and his wife fell in love with Islay and he started developing his Islayinfo website in 2005, adding the Islay Weblog in 2006 as well. Funnily enough he also launched an Islay photo blog at almost exactly the same time as me. I suspect he'll say similar things about getting to know people and sharing information. There's much more to all this though: While Ron and I do our bit there are so many more things. There's the Isle of Islay Appreciation Society! on Facebook. There's an Islay & Jura group on Flickr and another Islay group, both with well over 1,000 pictures. There are over a hundred Islay, Jura and Colonsay videos on YouTube. There are quite a few Islay related blogs, both from Islay (in particular from the birdwatching community) and from around the world (check my Islay blog roll for details). Using internet technology Ian Stuart and his students at Islay High School ran joint projects with a school in Georgia, USA. On the Warehouse No.4 forum Islay whiskies are discussed and in The Stillroom a weekly chat is held (I believe with regular guests from the distilleries). All of this has one thing in common: People sharing a common interest with a large number of people and communicating with a large number of people. Something that wasn't possible so easily and in that form before. While there certainly are dark sides to the internet I think this benefit of bringing together a huge worldwide ‘Islay community’ and allowing it to communicate by far outweighs the problems. So that's my experience and view of Islay and the power of the internet. What's yours? May be share your views and experiences in the comments?